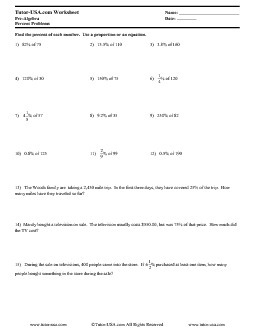 This Free Pre-Algebra Worksheet contains problems involving percents. Problems include writing expressions as percents, finding a percentage of a given number, and solving a variety of word problems using percents. 6. To find percents and write expressions as percents. Find the percent of each number. Use a proportion or an equation. 13) The Woods family are taking a 2,430 mile trip. In the first three days, they have covered 25% of the trip. How many miles have they traveled so far? 14) Mandy bought a television on sale. The television usually costs $550.00, but was 75% of that price. How much did the TV cost?